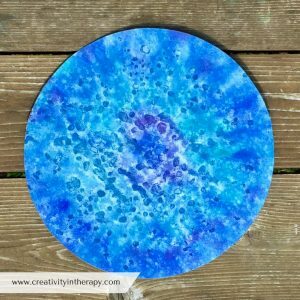 This week I’ve been playing with another fun art technique – sprinkling salt on a wet watercolor painting. 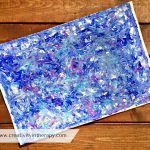 Like the last blog post – Watercolor & Oil Pastel Resist Painting – this technique encourages a more process-oriented focus in the art-making or art therapy. It’s also a lot of fun! It’s fascinating to watch the wet watercolor react to the salt. There is some immediate effect that you see as you add the salt (more noticeable with larger crystals), but when you come back and brush off the salt, you can see the real transformation. 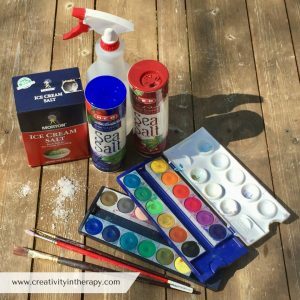 The texture the salt creates in the paint adds interest to any painting, no matter the creator’s level of artistic ability. The weather was beautiful this weekend in Austin, so I spent some time outside playing with the salt and paint technique. 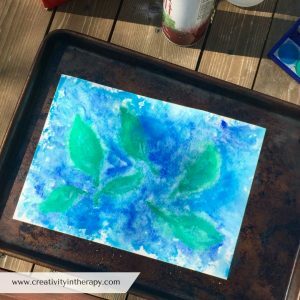 For a few of the pictures, I was inspired to include some of the nature imagery around me – early green leaves sprouting on the plants and the still bare oak trees silhouetted against the blue sky. For others I simply enjoyed playing with the paint, enjoying the experience of watching the paint move around the page, and responding to the music I was listening to. If you follow @creativityintherapy on Instagram, you might have also seen the picture of my toddler playing with watercolors and salt too. He absolutely loves the process of painting, spraying the page with a water bottle, and then sprinkling salt on at the end. * Includes Amazon affiliate links. Your purchases support the blog. After painting your picture (or after completing a section), sprinkle the salt while the paint is still wet. I like wetting the paper first with a spray bottle so that I can work wet on wet and experience the fluidity and unpredictability of the watercolor. Because the paint needs to be wet for the salt to have any effect, I find that this process works best when it’s quick and fluid or when you continue to layer wet paint over different areas. Allow the paint to fully dry and then brush off the salt. A dry sponge can be helpful to remove stuck on salt– use the scrubbing pad to scrub off the dried salt. Enjoy the final picture as is, go back over it with other media, or cut up for collage. 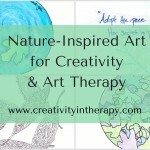 As with many interventions, this art technique can work on different levels, depending on the client or the direction of the art therapist. 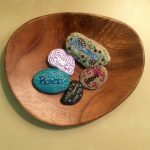 In my experience, this activity lends itself well to mindfulness practice in art therapy. 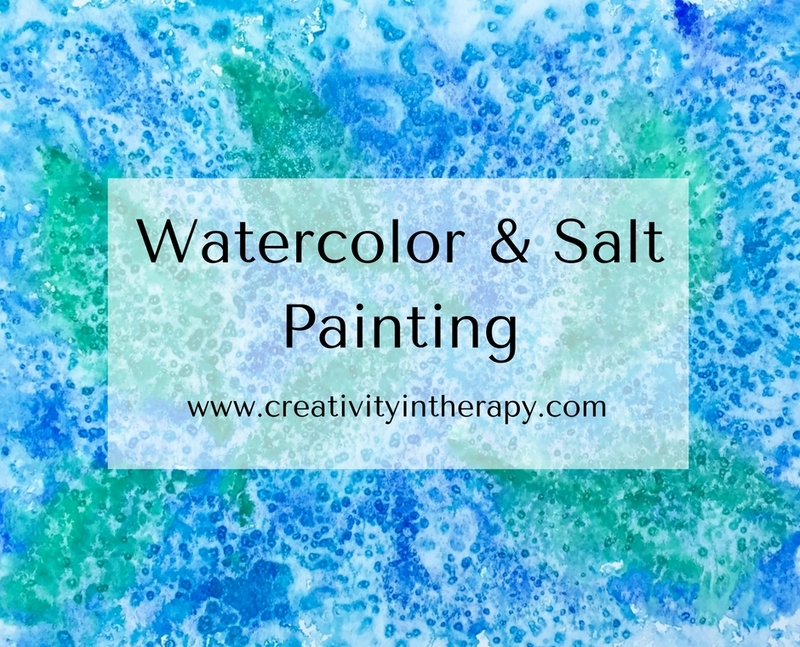 Clients can be encouraged to immerse themselves in the exercise, really focusing on being aware of the colors, the movement of the paint, and the effect as the salt is added. This is also a good exercise to practice giving up control and accepting what happens in the process. 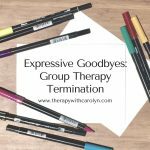 Looking at this activity through the lens of the Expressive Therapies Continuum, here are some more thoughts on how it can be used therapeutically (note – I’m using Hinz, 2009 as my reference for the ETC). 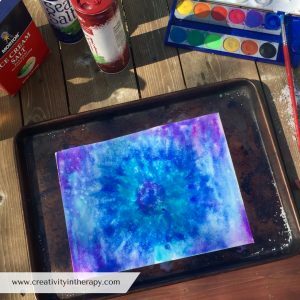 On the Kinesthetic side, art can be healing by activating a client’s energy or allowing the discharge of energy to reduce tension. 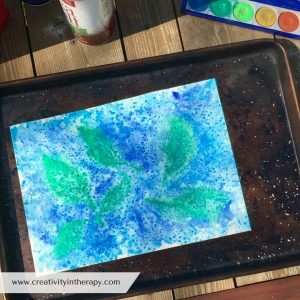 Working wet on wet with the watercolor, trying to cover the whole page with paint, and the additional activities of spraying with the spray bottle and sprinkling salt can all help to activate a client’s kinesthetic expression. My own experience (and what I see most often in clients) in doing this activity is that they become more energized as they become engaged in the process and then leave the activity with a sense of relaxation. 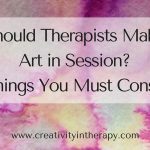 On the Sensory side, art is healing as the sensory experience allows the mind to relax, easing thoughts and feelings as the focus moves to the physical sensations. To enhance the visual sensory experience, you can encourage clients to really notice the way the paint moves, blends, and changes as they work. 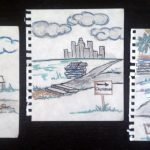 Suggest that they try spraying the paper with water and then touching the paint to the wet puddles or try dripping paint on the page, watching as the color spreads out on its own. If clients are sprinkling salt with their hands (as opposed to just shaking it out of a container), there will be the addition of a more tactile experience. As the salt settles on the wet paint, encourage clients to visually observe the effect that it has on the paint. Perceptual and Affective dimensions also emerge from this activity. 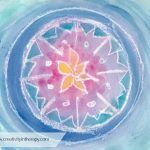 You can help clients access the Perceptual component by having them find and develop an image either as they work or after the paper has dried. 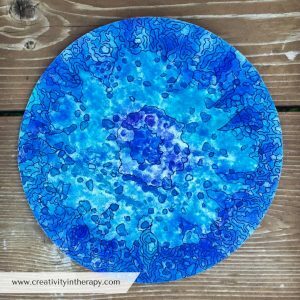 I developed one of my salt paintings into a mandala by adding pen lines, using the patterns of the paint to inspire me. 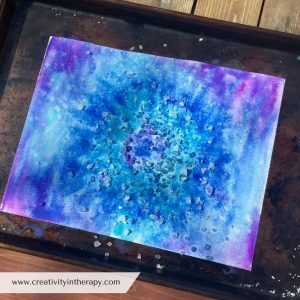 You can also incorporate salt and watercolor into art that is focused on observing the world around you, which is primarily a Perceptual activity. As an example, one of my art pieces started as an oil pastel drawing observing a tree from my backyard. The initial part of the art process was very focused on perception and form. But I then went over the picture with watercolor and sprinkled salt, increasing the Kinesthetic/Sensory component of the experience. 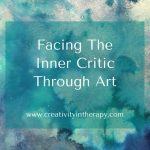 You can lead clients towards an Affective experience by asking questions that help them be aware of their own emotions as they work or help them notice emotions that they may have expressed in their painting unintentionally. 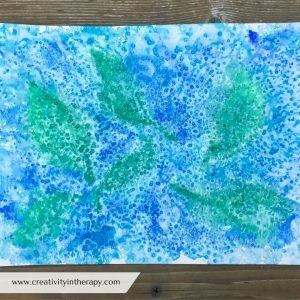 An art therapist may also give the client a prompt to do an abstract emotions painting, providing salt/watercolor as one of the materials that can be used. The fluid, unstructured nature of watercolor, especially when working wet on wet, is believed to trigger more affective expression in art. 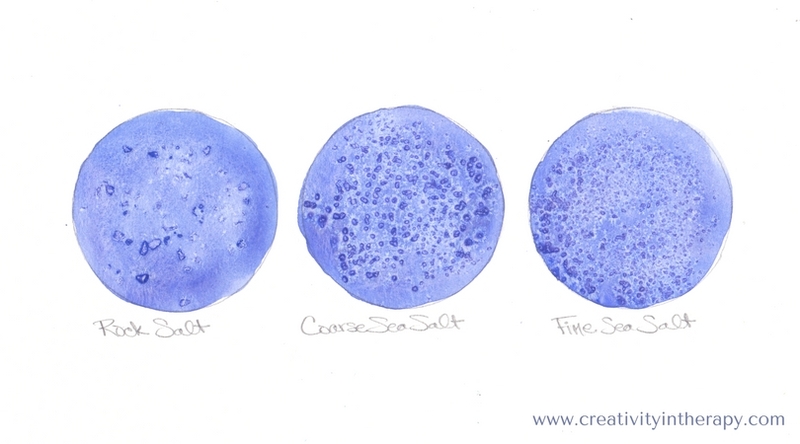 If you haven’t tried salt with watercolor painting, I hope that you’ll give it a try! Is this a new technique for you or one that you regularly use? I’d love to hear and hope that you share in the comments below. This technique is terrific for ALL ages! I’ll definitely be playing around with it this weekend, thank you so much for going into such great detail. I never thought of using food color so Im looking forward to experimenting with it, I have some leftover easter egg dye, regular liquid food coloring and also bakers food coloring. Can’t wait to experiment, thank you so much! Thanks for reading! Hope you had fun experimenting and playing with technique.